Robert Powell and Paula Squires. 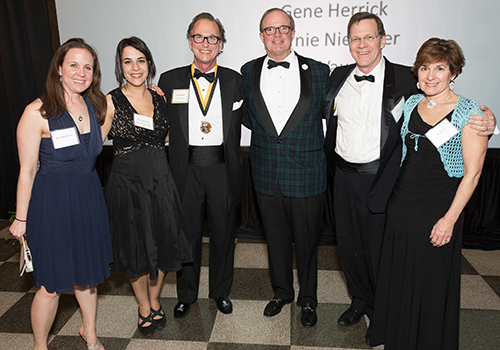 Bernie Niemeier, the president and publisher of Virginia Business, was inducted into the Virginia Communications Hall of Fame in March. National Basketball Association; Jane Gardner, a former television news anchor who lectures on resilience and cancer survival and does voice work for Studio Center; Gene Herrick, a retired Associated Press photographer; Jesse Vaughan, a film director who heads the Advance Creative Services Group at Virginia State University; and Dwayne Yancey, the editorial page editor of The Roanoke Times, who also is an author and playwright. Niemeier has been publisher of Virginia Business since 2007. In 2009, he led a private-equity funded purchase of the magazine from its owner, Media General Inc. Last June, he purchased the company’s outstanding shares from his partners, becoming sole owner of the magazine. Niemeier spent more than 30 years in the newspaper business, including 17 on Media General’s corporate staff where he served as division vice president in charge of strategic planning, market research and newspaper acquisitions. Niemeier has won a number of awards for editorial writing from the Virginia Press Association and the Alliance of Area Business Publishers. He serves on the board of trustees at Sweet Briar College and is a past board member of the Virginia Chamber of Commerce and a past chair of LEAD Virginia. The Virginia Communications Hall of Fame is housed at the Robertson School of Media and Culture at Virginia Commonwealth University.